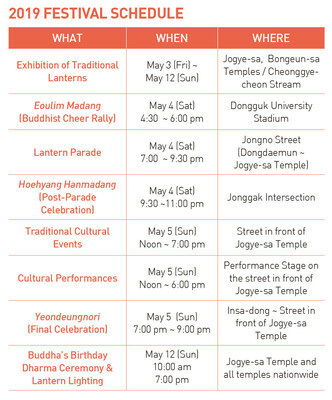 SEOUL, South Korea, April 12, 2019 /PRNewswire/ -- The annual Lotus Lantern Festival, Yeondeunghoe, will take place to celebrate Buddha's birthday from May 3 through 5 in downtown Seoul and along the street in front of the Jogyesa Temple. Prior to the festival, the lighting ceremony for Mireuksa Temple's Stone Pagoda-shaped lantern is scheduled at 7 p.m. on April 17 in Gwanghwamun, Seoul. Yeondeunghoe, designated as Korea's National Intangible Cultural Property No. 122, has been held for around 1,200 years, and its traditional culture has been promulgated from generation to generation while promoting the community spirit. In particular, this year's festival will be held to pray for world peace and the Korean Peninsula to overcome various conflicts in the society with a spirit of mercy. The Lantern Parade, the highlight of the festival, will take place on May 4, during which participants will put a wish message on their lanterns for well-beings of themselves, their families, neighbors and the society. Thousands of wish lanterns will become a wave of dreams for peace. More than 2,000 foreigners will also join the parade with International Dharma Instructors. The Traditional Lantern Exhibitions will also attract the attention from citizens and visitors. The exhibitions, which run from May 3 to May 12 at the Ujeong Park next to the Jogyesa Temple, the Bongeunsa Temple and the Cheonggyecheon Stream. Displayed lanterns will shed light on the temple and the Cheonggyecheon Stream with the beauty of the lanterns' hanji, or Korean traditional paper. This year's Cheonggyecheon Lantern Exhibition celebrated its 12th anniversary. It will be held from April 27 to May 12 with the theme of "A Flower of Peace Comes Out on the Korean Peninsula," combining people's aspirations for peace and unification. The "Global Supporters for the Lantern Festival", consist of 60 young people from 26 countries, will carry out volunteer work during the festival. These Supporters, who are trained through templestay and traditional culture education, will provide guide and interpretation services for visitors, and perform flash mobs at the lighting ceremony, Traditional Cultural Events, and at the Tapgol Park during the lantern parade.